The negative reaction to the social protests of the “gilets jaunes” by parts of the German left is not only wrong – it is dangerous. Originally published by Lower Class Magazine. Edited machine translation by Enough is Enough. Since November 17 France is burning. Tens of thousands of demonstrators, often wearing yellow signal vests, are paralyzing the country. The protests, which initially were directed against an announced increase of gasoline prices, soon became a general revolt against Emmanuel Macron’s neoliberal government. 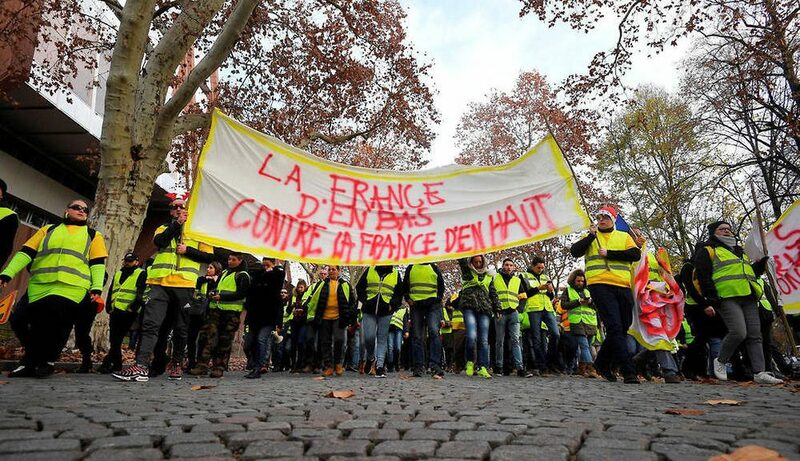 The movement of the gilets jaunes began as a spontaneous rebellion against an unfair tax system: “Excise taxes for the masses are increased, while the rich are barely paying anything” – are the simple reason of the outrage. Further demands – such as a minimum wage that is high enough to cover daily life – were added. In no time one million people signed the online petition of the yellow vests, many thousands fought street battles with the brutally acting state power. Actually – one would think so – a fixed reference point for inter-European, left-wing solidarity. And just a few years ago, like with the protests against the crisis in Greece or Spain, we would certainly have seen left-wing solidarity demos in Berlin – as small and ineffective howsoever. But the coordinate system, especially of the liberal left in Germany, has shifted. From the feeling of own powerlessness follows the fear of change. One dares not, so one hangs on the illusion that the bourgeois state may at least not break the thin civilizational ice, which allows a vegan meal in the university cafeteria or the job as a speech writer in German Bundestag. It would almost be funny if it wasn’t so sad: The German right, trying to copy the “gilets jaunes” with bizarre shows and the state-loyal reformist left basically agree with each other with their assessment of the French movement. Both believe that it is something between Pegida and peace vigils (In Germany there are so-called peace vigils of the far right, EIE), just bigger and more powerful. This is complete nonsense. The “yellow vests” are a relatively typical spontaneous social mass movement. And classically, such movements are ideologically diffuse. They spark because of concrete problems of the people, and when the shoe pinches hard, they grow and acuminate. In such a movement, there are negotiation processes, which ideological hegemony prevails. Many comrades in France face this struggle and are part of the protest movement against fascists – with words and fists. There is a good basis to do that. Because the peg on what to hang the protests on is just not, as with Pegida, the need to kick down to people who are, allegedly, even more below. The demands for a minimum wage, the resignation of a neoliberal, imperialist government and more tax justice are hardly revolutionary. But in contrast to the bizarre copy attempts of German fascists, the masses are not concerned with the “migration pact” or “mass immigration.” The French yellow vests do not begrudge the smartphone of a refugee, but wants to fight their own government. The “gilets jaunes” are more akin to the crisis protests in Greece or the Gezi revolt in Turkey than they have anything in common with Pegida. Tens of thousands of Turkish nationalists were involved in the latter, ignored by the liberal left of Germany, who are interested in projection screens, not actual movements. And yet, the Turkish and Kurdish left never said: “Nope, we’d rather go home.” The announcement was: “These are our protests.” And clearly: in Gezi Park there were regular fights when nationalists tried to remove Kurdish flags. They won these fights, anchored leftist demands in the overall movement and shaped this movement. One can win battles for the hegemony of a movement – or one can lose them. That depends on the objective conditions (what sparks a movement, what is its social composition). And of the subjective – that is, whether one is strong enough to interfere and enforce. In the Gezi protests both conditions were certainly better than they are in France today. But even there the situation is by no means hopeless. However, what parts of the Linkspartei (German Leftwing party, EIE), but also a generation without any kind of social movement and an uncoupled from everything else pseudo-anti-fascism accustomed to a generation of non-parlamentarian leftwingers now do, is even more fatal than losing. If you lose, you have fought and learned something. And in any case you could win a part of the people for your arguments. But what the brave left wants, so you can not even learn something, let alone win someone: Under the reference to the appropriation attempts of right pied piper they not only want to surrender before any kind of fight even started. It also suits them best to force all others to surrender also by threatening with excommunication. Who does not give up from the beginning, hiding and keeping the vest morally clean, that’s just “Querfront” ((In English: Red-Brown coalition, EIE).. Such a left, perceived by more and more people as part of the elite, as a loyal opposition of the rulers (and indeed it increasingly is), can pat on each other’s back during discussions in university lectures or be illustrious in parliament Speeches that are respected by many bourgeois journalists – but they can not change a society for the better. However, where this policy will lead to in a few years or decades, those who are already anxious today should actually be afraid of it. Next post: #HambacherForest: Will there still be a deforesting season soon?